It is difficult to avoid all the hype that has been recently created by Google for Jobs, also known as the Job Search Experience. But do you know what it could mean for you as a recruitment professional? As Google for Jobs might have an impact on job boards and your career page, it is important to prepare your job descriptions for this new feature. This blog post lists 3 practical tips to get your jobs up to a great start for the improved Google’s Job Search Experience. Google for Jobs is an improved Google search feature to find a job with more ease and fully within the Google search experience. It provides an overview of job offers that are gathered from different sources. Within Google for Jobs, a candidate can refine their job search using filters, compare jobs and review the results. Only when they hit the apply button, they will be directed to the site where the job was originally published or found. This new user flow will change the user journey and therefore might have an impact on the traffic to your career page or on job boards. The original job search had the candidate land on your career page or job board directly, as displayed in the image above. 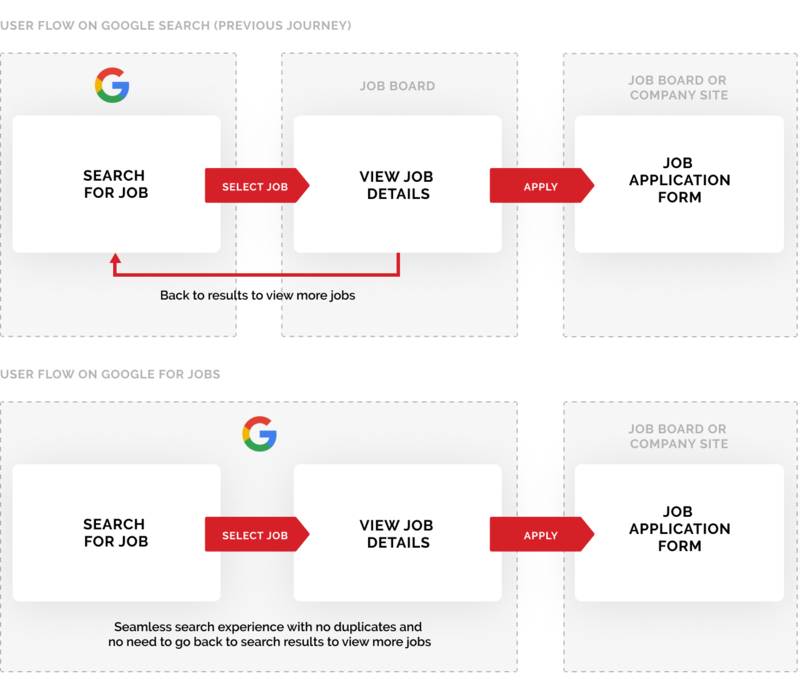 With the new Job Search Experience, the candidate’s first touch point might be on the job detail page of Google for Jobs. This could mean a decrease in traffic to your career page, but it can positively influence the application rate. Because the job seeker has already read the full description of your job and has clicked on the apply button showing their interest in this job position, this candidate might be more likely to complete their application on your career page. As the new Job Search Experience is based on organic and free (at least for now) search results, it offers numerous opportunities for your jobs. With the following 3 practical tips you can start your preparation right away! Tip 1: Pay close attention to Google for Jobs’ guidelines on ‘structured data’. Within Google for Jobs, the candidate is not just able to review the jobs they are interested in, but they can use filters in order to find them faster and easier. To make it easier for your ideal candidate to find your job, you need to add these filters in your job description. If you fail to do so, your job might not end up in the job overview as Google would not be able to either read or rank it. That is why, Google has set up a few guidelines on how job descriptions need to be written to meet the requirements. These guidelines are called ‘structured data’, The information that should not be missing in your job description is: Job title, Company name, Location, Address, Date of your job posting. Do not forget to include salary! The salary is an important part of the job description, not just for candidates but also for Google for Jobs. If you do not add a salary to your job description, Google for Jobs will. They will research similar jobs and generate a range that is realistic for this position. Extra tip: Use the free Google Testing Tool to check if the structured data in your job description is complete and in order. Great content has been, still is and will continue being key to attracting qualified candidates. Your job description should always be attractive for your target audience, trigger their attention and stand out from that of competitors. An appealing introduction is essential for catching the attention of your target group and make you stand out. In Google for Jobs, the introduction is not just the beginning of your job description, but also the only part (the first 5 to 25 lines) of your job that is visible to the potential candidates. It takes an extra click to see the full description. Once you caught the attention of the candidate with your catchy introduction, you want them to read the full text and click on the apply button. Therefore, it is important to make your job text reader-friendly. By adding subheadings, using bullet points and focusing on the USP’s of your job and organisation, you can make your job description most appealing for your target audience. Using structured data and focusing on the content of your job description are all already adding up to Search Engine Optimisation (SEO). If your job description or career page cannot be found by Google, your traffic and incoming applications will suffer too. It is better to use a straightforward job title (and not “marketing magician” or “analytics ninja”) that gives the job seeker a clear idea on what the job entails and what skills or years of experience they need to bring to the table (e.g. Junior Account Manager or Social Media Marketing). Extra tip: You can use the free Google trends tool to see if the job title you have in mind is actually used in queries and also compare different job titles to make the right decision. Once you have found the right title for your job description, it is important to mention it in the first paragraph and subheading. Keep readability in mind and avoid excessive use of keywords as you’d be running the risk of being penalised by Google for ‘keyword stuffing’. Try to find synonyms for your job title and add a few relevant keywords to improve your SEO and the chance to be found by your ideal candidate. Extra tip: Is your career page SEO-proof? Use the (free) Lighthouse tool to receive an extensive report about your SEO performance and tips on how you can improve it. You are now all set up and ready to prepare your job description for the arrival of Google for Jobs! Still not sure where to start, how to advance or simply prefer to get an advice from an expert? Feel free to reach out to our experts for a free advice. They’d love to help!